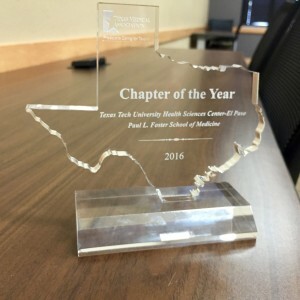 The Texas Medical Association (TMA), which is the largest state medical association in the country, recently recognized the Texas Tech University Health Science Center El Paso (TTUHSC El Paso) as Student Chapter of the Year. The student chapter was started in 2009 and was praised for its growth and organization. Specifically, with the founding of the RotaCare Clinic back in 2014. The RotaCare Clinic is run by medical students and residents and provides free health services to the community regardless of ability to pay. The TMA also recently awarded it’s annual Minority Scholarship award to 11 individuals. This scholarship started back in 1998 and is designed to help ease the financial cost of medical school that can easily run into the six figure range. To date, the scholarship program has awarded 112 separate scholarships with a total gift of $615,000. This year’s recipients each will be awarded $10,000. Two of the awardees are from El Paso and one, Stephanie Trujilo-Molina, will be attending the Paul L. Foster School of Medicine.